When buying new HA, how do you know the Volume limit of the HA? and what I mean by that is "how much volume play, adjustment or upside does one have when finally setting software levels on new HA’s. Personally I like to know “say on a scale of one to ten” what my current aids are set at so I know how much upward adjustment aids can handle if I lose more hearing. So if level is one is lowest level of HA volume setting and level ten highest (maxed out), should’t an Audi be able to tell me what my current volume range setting is and how much (upward adjustment) I have left before I max out HA volume? Buying a HA is some what challenging from a “high tech” standpoint but no one likes to be in the dark as far as buying HA’s and not knowing if HA volume adjustment level is low, medium or high and if current setting can be, or can’t be bumped up over a number of years. In plain English - I hate to buy a HA that I thought would last a long time only to find out I bought a Widex, Phonak, Resound that was at its “software limits” at time to purchase, versus no where near its software limits from day one of use. The gray area at the top is the full on gain limit. The slightly darker gray area surrounding the gain curves represent the limits of volume control. I’d suggest getting either a Phonak Naida B utrapower (675 battery) or a Resound Enzo 3D (675 battery). There’s nothing more powerful. They go up to 120dB so if you need more, you need a cochlear implant. I know I answered a different question than you asked, but what you asked doesn’t have a simple answer. Sierra gave you a good answer, but how much headroom you have will depend on the frequency, how well feedback is controlled and what frequency lowering settings are used. It depends on your hearing loss. Simple amplification wouldn’t fix everyone problems. Exposure to loud sounds for a long period of time will worsen your hearing loss. Instead of amplification of all sounds at the same time, some HA choose which ones to turn up and vice versa. How well the HA performs this function is important. There are other sound enhancing techniques that HA uses that improves your ability to hear better overall. Simply relying on volume control isn’t in your best interest . You might think your able to tolerate a sound level but it might be too loud and speed up your hearing loss over time. If all else fails, turn it up. Otherwise, HA programs, if set up correctly, may help you better in the long run. The software upgrade part is totally false. HA. Companies operate like Apple. Release a new model and tell the Audi to recommend it because it’s how business works. Unfortunately, there isn’t much you can do about that right now. The Big 5 or Big 6, own the HA industry and you don’t have any good choices after you exhausted all their options being provided. So you hope some company has a HA that is suitable for you at the price range. Another option is to DIY, but you need to invest in learning how to perform them properly. You also need the equipment. and what I mean by that is "how much volume play, adjustment or upside does one have when finally setting software levels on new HA’s. Whether they are BTE, in the ear, or RIC style, every hearing aid has a maximum gain potential, usually called full-on-gain and I think it is usually measured at 1600hz. So, if your hearing aids have a full-on-gain of 50db, and the gain settings in the fitting software for your hearing loss range from 15 to 35db, you would have “headroom”, at your worst hearing frequencies, of about 15 db. I put your Audiogram into the Connexx software I have and selected the highest power units that Rexton/Signia have in the RIC class. The HP receiver is rated at 130 dB. The software automatically selected molds with no vents. It also automatically turned on frequency shifting down from those frequencies above about 4500 Hz. These are the areas in red and blue. The lighter gray area at the top is the Full On Gain limit. The cross hatched area is the maximum power output, and the darker gray is the volume control limits. That said, I would say that there is no headroom above about 2500 Hz, and very little above 750 Hz. 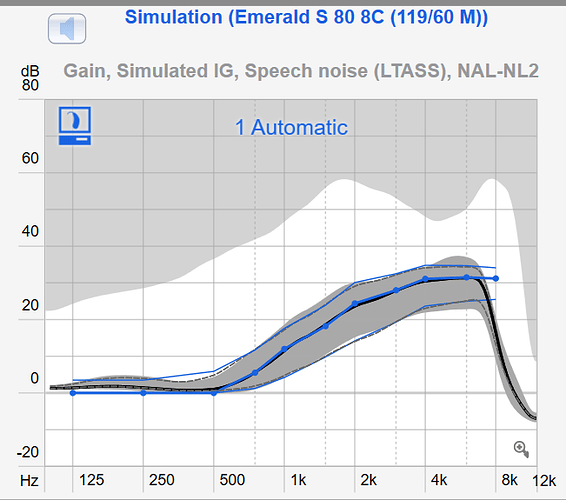 If you are looking at hearing aids, the fitter should be able to show you a graph like this for what they are recommending.